The Blue Moon Brewing company, located in Colorado, began brewing in 1995. According to their website, the Belgian White was one of their first and most popular beers, winning the World Beer Championships three times in a row. Blue Moon beer ingredients include white wheat, oats, coriander and orange peel. Blue Moon beer comes in 12 oz. bottles and contains 5.4 percent alcohol by volume. There are 171 calories in a 12 oz. bottle of Blue Moon beer. The National Strength and Conditioning Association recommends consuming 16 calories per kilogram of body weight for women and 17 g per kilogram for men. For a 165 lb. individual, one bottle of Blue Moon beer equates to about 6 percent of the daily recommended calorie intake for both women and men. A common misconception is that beer increases fat. However, neither Blue Moon nor most other alcoholic beverages contain any trace of fat. The reason alcohol causes weight gain is because of the empty calories it contains. Alcohol contains just two fewer calories than fat, but does not supply the body with any nutrients. When the body receives alcohol, it uses this alcohol for energy rather than burning excess fat and carbohydrates. 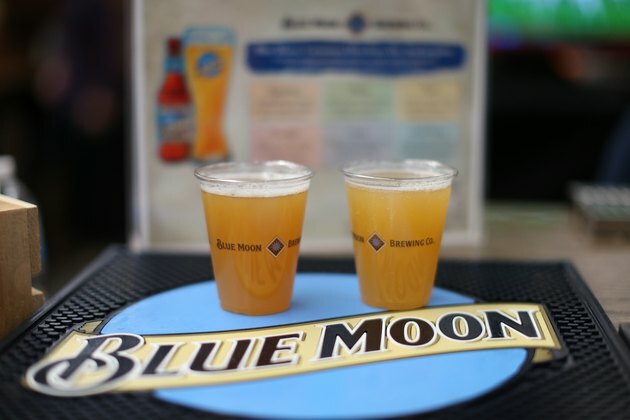 There are 8 mg of sodium in each bottle of Blue Moon beer. Sodium is a mineral commonly found in animal products, the National Strength and Conditioning Association reports. High sodium is associated with high blood pressure and the National Strength and Conditioning Association suggests limiting sodium intake to less than 2,400 mg per day. A bottle of Blue Moon beer contains 13.7 g of carbohydrates, according to their website. Carbohydrates serve as an energy source and are composed of sugar. The National Strength and Conditioning Association recommends between 50 g and 100 g of carbohydrate each day, about 45 to 65 percent of daily calorie intake. There isn't protein in Blue Moon beer. While protein is an essential nutrient, most alcoholic beverages do not supply a sufficient source. However, according to weight management author Anne Collins, some alcoholic beverages do contain traces of protein. For example, wine contains between 0.1 g to 0.2 g of protein and some beer contains up to about 3 g per serving. The National Strength and Conditioning Association recommends 10 to 15 percent of daily calorie intake come from protein, so alcohol cannot be relied upon to supply the amount the body needs. The only vitamin or mineral, besides sodium, found in Blue Moon beer is calcium. The National Strength and Conditioning Association asserts that calcium is associated with bone growth and density, and people should strive to consume at least 1,000 mg each day. Blue Moon beer only contains about 1 percent of this amount.